Hempcrete is one of the most amazing building products made from industrial hemp. All it is, is hemp hurds, or the center of the stalk, water, and lime (which is powdered limestone). Mix it together in a slurry and form it in to the wall of a building and over time the chemical reactions between the water, lime and Hemp will petrify the hemp and turn the lime back into stone. Why use hempcrete instead of concrete? Modern day building materials are either mined from the earth or harvested from centuries old forests. Hemp crops can be harvested annually in perpetuity. One acre of hemp provides as much paper as 4.1 acres of trees. Considering the trees take decades to grow and hemp takes about 4 months, the advantages become clear.1 In some areas of the US, you can grow more than one crop of hemp a year. The one drawback is that hempcrete takes a long time to cure, so is not good to use for load bearing walls. 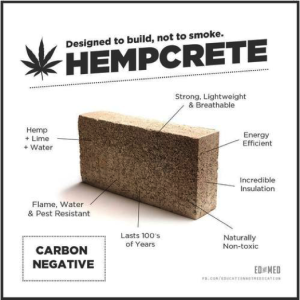 To make up for this, companies started making hempcrete bricks. There are quite a few companies that make hempcrete bricks. They manufacture them in a way that it takes a lot less time to cure than just putting the slurry into the wall cavity. There are various ways they are made, some put the slurry into wooden forms and left to dry, some are pressed in machines some forming a brick, then left to cure. Some companies put supporting structures such as 2×2’s in them so you can use them for load bearing walls immediately. After they are suitably cured, they are able to be stacked just like normal bricks although they are usually a few inches thicker than regular cinderblocks they are a lot lighter. With these bricks, the need for a wooden frame is practically zero, and since they eventually turn to petrified rock they will last for hundreds of years. I myself have designed a hempcrete block that is accessible for electric and water.